Baby Shower Cupcakes are the latest rage. Cupcake baby shower ideas are now as popular as, a classic baby shower cake! What’s so cool about cupcakes? cupcake, chances are you have another dozen or more,to work with! Some more ideas for edible cupcake decorating: Use candy molds of ducks, or other baby shower themes.Use softened candy to create some very amazing decorations. Some good candy to work with: tootsie rolls, gummy bears,licorice, gum drops, and caramel candy… just to name a few! This book, By Karen Tack, is full of illustrations, detailed instructions, and lots, and lots of ideas for making some incredible cupcakes. 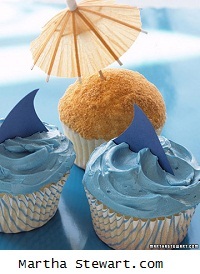 Depending on your level of expertise, some of the cupcake ideas are pretty simple, while others are more complex. You can find the book online at Amazon.com, your local bookstore probably offers it; or check with your local library. More summer inspiration:Try this idea from kimbu.com. Top ice cream cones with your cupcakes and decorate tops with swirl frosting. Put cakes inside little tea cups, or other petite drinking cups. Purchase or make paper cones, place cakes inside, add frosting and sprinkles. The ideas are endless…. Scoop and press (warm from the oven) cake into cone. Top with frosting and decorate! These are cupcakes grouped together that look like a cake. You can also line-up your little pastries, and top them with letters to spell-out a name or message. You can make a caterpillar, a train, a rainbow…or whatever your imagination comes up with. 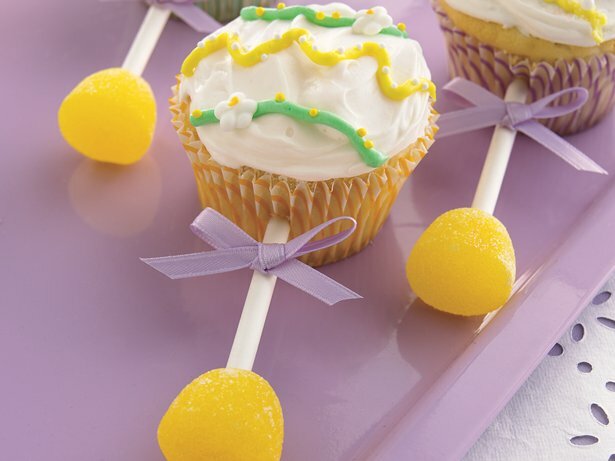 Cupcake stands are great, and they can be purchased at party stores, online and at most department stores. However, there’s no rule that says, “you must use a stand“. baby shower cupcakes and baby shower cake-you can do that!